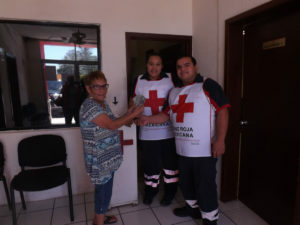 The coins dropped into collections cans thrust out by Cruz Roja (Red Cross) volunteers on Benito Juarez add up; but the organization hit the jackpot when it became the designated charity for the 10th annual Cholla Bay Sportsman’s Club Horseshoe and Corn Hole Tournament. The CBSC presented $1,500 in cash to Cruz Roja in May. The money, a portion of the proceeds from the tournament which took place in April, was in addition to $200 donated earlier by Michael & Darrel Smith, first place winners of the horseshoe tournament. The club holds a variety of events over the year to support the marine radio facility at the Cholla Bay launch area. That communication service has been a literal life saver for many boaters over the years. In addition, they support local non-profit organizations that serve the Mexican nationals and part time residents from the United States, Canada and around the world. Those who would like to be a part of the Sportsman’s Club can send a check for $40 (single or family membership) to membership chair Helen Dahlstrom at P.O. Box 77152, Tucson, AZ 85703. Membership is open to everyone. Horseshoe Tournament co-chair Billie Crumbley, presents $1,500 in cash to Josuá Bernal and Fernando Castillo, representatives of Puerto Peñasco Cruz Roja, this year’s chosen charity. The balance of the tournament proceeds will help support the marine radio facility operated by the Cholla Bay Sportsman’s Club at Cholla Bay.